Overall, Stan & Ollie is a heartwarming film that takes you back into a time that no longer exists. When one thinks of comedy legends, Stan Laurel and Oliver Hardy are definitely on the list. This duo began their career in the late 1920s and went on to become not only 2 of the best-known comedians, but two of the best-known celebrities in the world. In a word, they are iconic. The film Stan & Ollie was released in 2018, bringing the two men back to life on the big screen. Now, you can add this delightful film to your home entertainment collection on Blu-ray. This film takes a look at Stan Laurel (Steve Coogan; Philomena) and Oliver Hardy (John C. Reilly; Walk Hard: The Dewey Cox Story) after they have already conquered the world of comedy but are now facing an uncertain future with their dwindling popularity. It's the 1950s and the pair are both struggling with financial issues, as well as what we all face - the complications of aging. They are given a chance to revive their career and though, at first, it seems like it's not going to happen, they eventually regain their popularity with a show they take on the road throughout Britain. While they are hoping that their renewed following will help aid them in getting their "Robin Hood" project put together, it actually threatens to destroy their relationship instead. Upon first seeing Coogan and Reilly on the screen, you instantly see the physical resemblance to the real Laurel and Hardy which helps the viewer to believe what they are watching. However, it doesn't stop there. Both actors managed to capture the very essence of each man and give a glimpse of not only the performance lives of the pair but also their personal lives. In the film, we get to meet their wives - Laurel's Russian wife Ida (Nina Arianda; Midnight in Paris) and Hardy's small-in-stature wife Lucille (Shirley Henderson; Harry Potter and the Goblet of Fire). While the wives aren't exactly best friends, they are each supportive of their husbands and their dreams. Another key role in this film was that of director Jon S. Baird (Vinyl). He brought everything together in this film to create a touching look at this duo, showing them as real men, not just their silly stage act. There is painstaking attention to detail in this film that transports you back to this time and into these lives. Presented in 1080p video with an aspect ratio of 2.39:1 this feature has a good quality picture. As mentioned, there is great attention to detail and this level of video showcases that nicely. You can see the detailed stitching on the costumes and their facial features are delineated well. The DTS-HD Master Audio 5.1 isn't quite as good as the video but is decent nonetheless. The soundtrack and dialogue tend to be front-loaded which doesn't leave a lot on the side channels in the way of ambient noise. 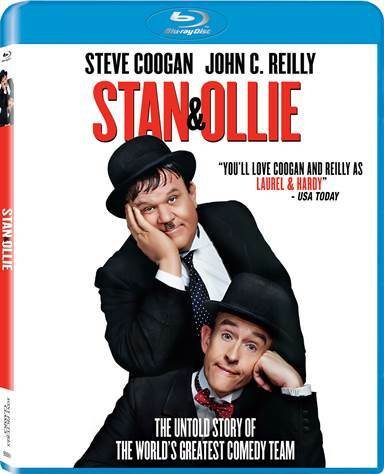 Special Features included with this title are four Featurettes - "Making Stan & Ollie", "Playful Prosthetics", The Dancing Duo", and "Q&A with Cast and Crew". Also included are three Deleted Scenes. Overall, this is a heartwarming film that takes you back into a time that no longer exists; yet, you can relate with the all too familiar struggles with life and relationships. It was enlightening to see how hard Stan Laurel & Oliver Hardy overcame obstacles and worked to achieve their enduring success. This isn't only a film for fans of Stan and Ollie but for anyone who enjoys a good story.